Metro has reached a tentative deal to buy a 149,700-square-foot vacant building at L'Enfant Plaza formerly known as the Reporter's Building. WASHINGTON — Metro has reached a tentative deal on a new headquarters at L’Enfant Plaza. Metro plans to buy a 149,700-square-foot vacant building at 300 7th Street SW, formerly known as the Reporter’s Building. The building would be stripped down and completely renovated before Metro moves in, new retail spaces would be added on the ground level. Metro is also considering adding three floors to the top of the building that could also be leased out to generate revenue. The renovated building would meet LEED-Gold energy efficiency standards. Metro declined to say how much the purchase or renovations will cost, calling the terms of the agreement confidential. A Metro Board committee will consider the purchase Thursday, with a final vote Nov. 15. If approved, Metro would close on the building by the end of the month. Design and construction on the new building would take about two years, starting a process that will allow Metro to sell and move out of the Jackson Graham Building at 5th and F streets Northwest. The agency has long hoped to sell its current aging headquarters, next to Capital One Arena and Judiciary Square, and recently went through a D.C. zoning process to allow more dense development on the site. The 270,000-square-foot building was built in 1974 above a Red Line tunnel, so demolition will need to be done carefully. It also houses backup Metro equipment and other systems, in addition to the agency’s main offices. This summer, Metro outlined its latest plans to lease new office space for several years until a new permanent headquarters is in place. 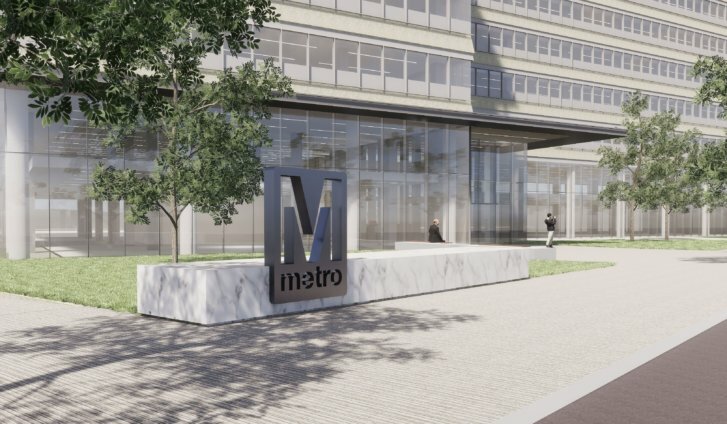 Eventually, Metro hopes to consolidate offices with three main spaces, one each in Maryland and Virginia to be purchased in the next year or two in addition to the new D.C. headquarters. Overall, Metro would have about seven office locations, down from the present 10, in hopes of boosting efficiency and saving on real estate costs long-term. General Manager Paul Wiedefeld also hopes newer offices with more modern amenities, in a building that does not have multiple failing or outdated systems, could help Metro lure higher-end talent.